The Casio CDP-130 is a fantastic keyboard with 88 fully weighted keys, perfect for beginners to learn basic piano technique with tons o.. The Casio CDP-130 is a fantastic keyboard with 88 fully weighted keys, perfect for beginners to learn basic piano technique with tons of useful features. The CDP-130 is a great introduction to the world of keyboards. With its high quality and powerful loudspeaker system, realistic tones and range of effects – playing the CDP-130 is fun and inspiring. To emulate the feel of playing a real piano, this Casio keyboard features 88 fully weighted keys using hammer action instead of springs. Just like with a real acoustic grand piano, the keys on the CDP-130 are heavier towards the lower register and lighter as you move up the keyboard. A dual-element Acoustic & Highly-Compressed Large-Waveform (AHL) sound source provides ten different tones for you to play with. Three levels of sensitivity help aid capturing the nuances of your playing while the improved string tones ensure your music sounds realistic, vibrant and inspring. Accomodating polyphony of up to 48 notes, the CDP-130 will not hinder the sound of your performance due to polyphony limitations. 10 different tones are available to you so you can try out a lot of different sounds to suit your mood and to make things even better, you can layer two tones at once such as piano and strings for a endless creativity and expression. Ten types of Reverb and five types of Chorus allow you to quickly customise your output so you can get your own unique tone. Giving you the sound of performing in a real concert hall, the CDP-130 has a HALL button. A quick tap of this button and the rich, warm acoustics of a concert hall will be recreated through the powerful integrated speakers. After purchasing and registering your CDP-130 you gain access to the Casio Music Academy and a series of online lessons worth £49.99 - the perfect way to get started on your new instrument! A conveniently built-in metronome makes rehearsals easy while five demo songs will inspire and provide fun backing tracks to play along to. The CDP-130 is MIDI compatible and can be connected to a computer using the integrated USB port for use with a range of music software. A standard jack output allows you to plug-in your favourite headphones and practice privately but you can also use the two Full Force Sound Speakers or connect to an external speaker system for performances. Included is a damper pedal that easily connects to the CDP-130 via a standard jack, giving you pedal features like those found on an acoustic piano. There’s also a music stand for you to place your sheet music or tablet to aid with rehearsals and recitals and it can easily be removed when not needed. Casio keyboards have a well-earned reputation for making great value keyboards and the CDP-130 is no exception. 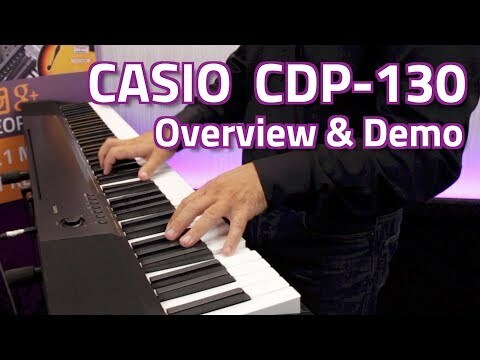 A really good first keyboard that is great to learn on, the CDP-130 is a shining example of a Casio keyboard for beginners and intermediate players alike. Input/Output Terminals: Headphones (standard jack), Sustain/damper, USB: type B, External power (12V DC) - USB cable (A-B type) required to use USB terminal for computer connection.